Flint and Steel fire making. For many, it conjures up images of an old mountain man wrapped in a Hudson Bay wool jacket striking a rock against a piece of metal to make fire as he braved a blizzard. But how does it work? Heck, does it even work at all? And how can you learn it? Aren't matches more reliable anyway? In this article we'll show you everything you need to know to become proficient in the traditional, reliable, quick, and easy to learn art of flint and steel, also known as flint steel, fire making. 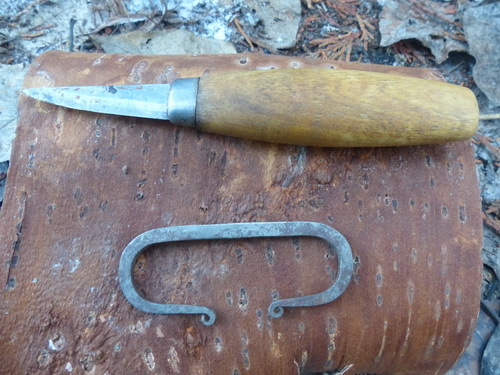 Reliable - with practice, flint and steel fire making is highly reliable, more so than modern matches. A single kit can consistently produce tens of thousands of fires, if not more. Try doing that with a pack of matches! Works when wet - Got a damp flint and steel kit? No problem. Just wipe off any excessive water and it is good to go, as long as your tinder is still dry. Wet matches are horrible for making fire. Windproof - Not only does flint and steel work in windy conditions, the wind actually helps the process. Anyone who has ever tried lighting matches in windy conditions knows how difficult a process it is. Childproof - Flint and steel fire making requires practice to consistently get fire. Without practice and good mentoring, kids won't be able to make fire. That said, communities like ours are working to guide children to learn these old arts, and the responsibility that comes along with them. Connection - Making fire by flint and steel puts you in direct connection with this primary element of life and survival. This level of direct connection is good for body, mind, heart, and soul. First, you strike the flint against the steel to produce a spark. You can also reverse this, and strike the steel against the flint to make your spark. Second, you catch the spark on char cloth, or other charred material. The charred material produces a glowing ember. 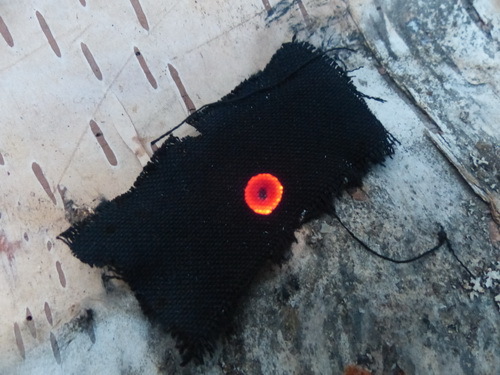 Third, the now glowing ember in the char cloth is transferred to a tinder bundle, and blown into flame. This is then placed in a structure of small, dry kindling and sticks prepared ahead of time which receives the burning tinder bundle. Examples include chert, jasper, agate, and quartz. There are many others that will work as well. 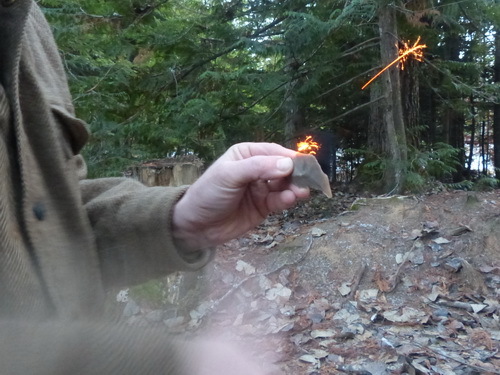 As you learn the art of making fire with a flint and steel kit, practice on new rocks as you find them. It is fun and easy and develops your skill. Your flint needs to be sharp, and kept sharp. A sharp piece of flint will cut off more steel to produce more sparks. 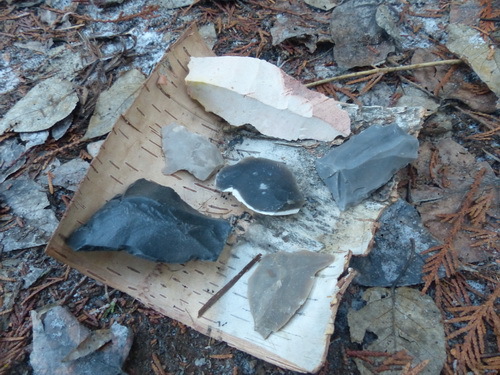 You can learn basic flint knapping skills to keep your flint sharp. Flint is available throughout many different bio regions, and online at various sources. Traditionally called firesteel, this material is actually high carbon steel that has been quenched to make it hard. Hard steel produces smaller, hotter, longer burning sparks. Stainless steel, commonly used in many modern knives, does not work for flint and steel fire making. Custom made firesteels are available, and you can also use the edge of an old file (4 - 5" in length works well). A knife can also be used, if it is made of high carbon steel. When using a knife for flint steel fire making, use its spine (back edge opposite the blade). Ideally the spine will have a flat surface, with 90 degree edges. It goes without saying to be careful when using a sharp knife. Softer steels can be used, at a cost. The trick is to keep your flint edge 90 degrees to the steel edge when striking. This is harder on both the flint and the steel, but will help in making your spark. Old files and knives are easy to find, and you can order custom firesteels at a variety of online sources. What many people don't realize is that the spark is actually a tiny bit of shaved off steel burning at around 800 degrees. Iron (steel) is a pyrophoric material. That means that very small amounts of it will spontaneously combust when exposed to oxygen after being shaved off by the sharp flint. Larger pieces don't combust because the iron has developed a thin layer of rust (iron oxide) on its outside surface. 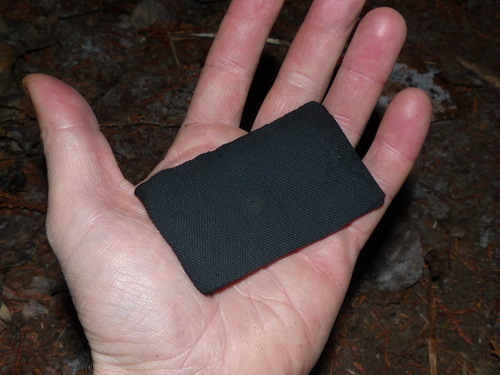 Char cloth, or charred cloth, is the ideal material to catch a spark. Char cloth is any 100% plant based fabric that has been charred, or cooked in an oxygen deprived setting. Synthetic material will not work, as it just melts rather than charring. An explanation of how to make char cloth can be found here. Two to four inch square or rectangle shaped pieces work best. Char cloth must be kept very dry in order for it to catch a spark. This is a bundle of very dry, soft, light, fine, fluffy plant or tree material that will receive the glowing ember on the char cloth. Ideally you want a softball sized bundle. Good sources include the inner bark fibers from trees like cedar, cottonwood, aspen, willow, and others. 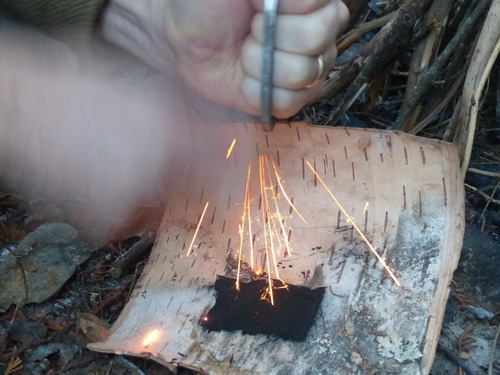 Use your knife or flint edge at a 90 degree angle to scrape off the fibers directly underneath the outer bark. Plant fibers like grass leaves or mosses also work, as do the seed heads of plants like goldenrod, phragmites, cattail, and milkweed. 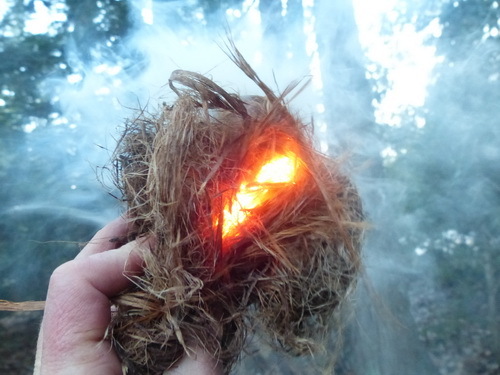 Prepare your tinder bundle to look like a bird's nest to receive the glowing ember on the char cloth. Got all your materials together? Now we're ready to go. Hold the flint in your dominant hand and strike down on the steel which is held stationary. A spark will travel downwards, and should be directed at your char cloth. The char cloth can be placed directly on the tinder bundle to aid the process. Use a shallow angle, and a glancing blow. The shallow angle will preserve the sharp edge of your flint. You want to hit fast, not hard. One foot is about the right distance to build up enough speed. Learn to avoid hitting both your fingers holding your steel, as well as the char cloth. In this method of flint steel fire making you hold the steel in your dominant hand and strike down on the flint edge which is held stationary, again at a shallow angle. You also hold your char cloth above the flint edge. As you strike, a spark will travel upward and catch on the char cloth. This method is more reliable because the spark doesn't have to travel as far. As such, it is more forgiving with less perfect materials. It is a bit slower as you will have to transfer your burning char cloth to your tinder bundle. A tip here is to use three or four pieces of char cloth stacked together, this will make it much easier to catch a spark. The glowing ember will last for a little while on your char cloth (or alternative), so take your time here. If you haven't already, transfer your burning char cloth to your tinder bundle. Fold the outside edges of the tinder bundle "bird's nest" around the burning char cloth, surrounding the burning char cloth into the center of your tinder bundle. Then blow slowly and steadily directly towards the burning ember, as if you are blowing through a straw. Position your tinder bundle to avoid smoke in your face, noting the wind. As you blow, the ember will glow until a good portion of the tinder bundle is glowing. Your tinder bundle may smoke profusely. Continue blowing, and it will burst into flame! 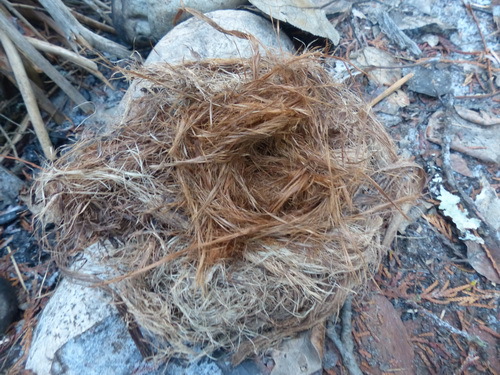 Place your burning tinder bundle in a prepared fire structure of dry, small twigs and sticks. Congratulations! You have just made fire by flint and steel! Welcome to an ancient society of traditional fire makers. I'll never forget the first time I blew a tinder bundle into flame. Although that moment happened many years ago, the memory of it is forever etched into my very being. I felt like the first man to ever make fire, as it fulfilled an ancient and archetypal need in me to provide. I was whole, and the circle of life was complete. Over the years I have mentored many in this art of fire making. It never ceases to amaze me what a profound impact this process has on people's self-confidence. People walk a little taller with this accomplishment under their belt. 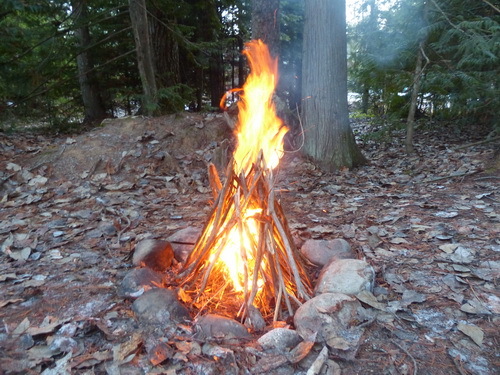 Like many ancient skills, flint and steel fire making gives people this deep connection to the primary element of fire, and what it is to be a human being. A deep fulfillment results, as they walk with one of the most important accomplishments of life itself, connection. Interested in being personally mentored in Wilderness Survival & Primitive Skills, on a transformational journey of connection to nature, community, and self?